Should social networking/marketing be decentralized (a positive experience)? There is a lot of talk about social marketing these days. Some feel it is the next big thing -- pushing the valuation of Facebook to billions of dollars. Others worry that it might be a bubble that will leave us with no real infrastructure or innovation gains when it bursts, and that the best and brightest among us are wasting their time and skill trying to get people to click on ads. I don't know how social marketing will evolve, but I do know that it did not begin with Facebook. Amazon was one of the first to capitalize on social media -- their user-written reviews surely contributed to their outstripping Barnes and Noble back in the earliest days of online book selling. I was reminded of the early days of Amazon because I just had a positive social shopping experience there. I went to the Amazon Web site to find a book, but found a book reviewer instead. The reviewer's name is J. Marsano. He did not like the book I was looking for, but I liked something about his review, so I started browsing through his other reviews. When I read his review of a picture book on Greek Mythology, I ordered it for my grandchildren. I bought the book without hesitation because I had gotten to know Marsano through his reviews. I learned that he lived in Brooklyn, was a fourth grade teacher, had an ipod, worked on boats, was married, was going to get a pet rabbit, bought his wife an ipod docking station for her birthday, etc. It felt nice -- I liked and trusted the guy. So, I took his advice and bought the book. The process was almost perfect -- it served my purpose and Amazon's. Only one glitch -- I had a question, and would have liked to send Marsano a message -- to ask for a recommendation for a kids book on Norse mythology. I could not do that through Amazon, so I had to ask it in a comment on his review and hope he sees it. Kind of like putting a note in a bottle and thrown into the sea. Do we really need to centralize our social marketing and media in Facebook or anywhere else? Would it be better to decentralize -- to add social networking as a feature wherever it is relevant? 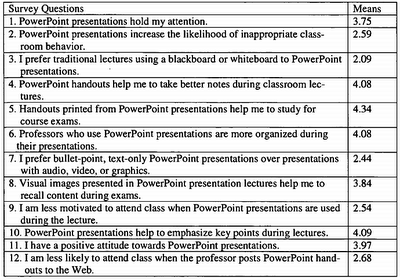 The table below shows responses of 160 University of Pittsburgh students to a ten-minute survey of their attitudes toward and use of PowerPoint. The survey questions were 5-level Likert scales -- a student could either disagree strongly, disagree somewhat, be neutral, agree somewhat or agree strongly with the statement. The survey was not random. It was taken by about half of the class -- the students who were motivated enough to attend an optional study session. Answer the questions for yourself, and see how you compare with the Pittsburgh students. For example, the strongest positive response was on printed handouts. Do you print PowerPoint handouts and study from them? These motivated students do. 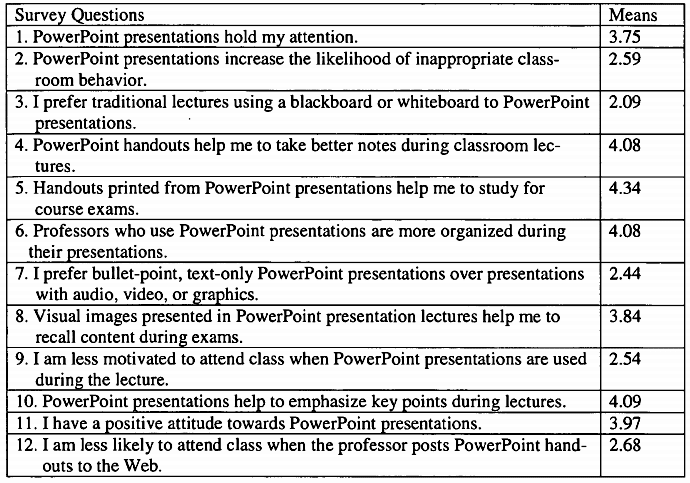 The study is described in Barbara A. Frey and David J. Birnbaum, Learner's Perceptions on the Value of PowerPoint in lectures, January 31 2002. Teaching, service and research are considered when evaluating university professors for retention, tenure and promotion (RTP). RTP committees generally look at things like teaching evaluations by students at the end of a class, published journal articles and conference papers, and service on school committees. Teaching: podcast lectures, develop online teaching material, help students via email, chat or VoIP, create a blog or Twitter stream relevant to a class. Service: build a Web site or other application for a department or conference, build a Web site or other application for an organization in the community, offer mentoring or advising to students in feeder schools, offer tech training to colleagues, develop campus infrastructure. Research: create a scholarly blog, publish in online journals, participate in online research communities, maintain an online database, make scholarly contributions to Wikipedia. What would you add to these lists? Which of these activities would count toward RTP on your campus? Which should? Auburn University recently considered significant contributions to Wikipedia in granting tenure to professor. Would your university have done so?